There's an initiative going throughout the month of April to encourage drivers to find an alternate way to work, school or any destination. ST. PETERSBURG, Fla. — There's an initiative going throughout the month of April to encourage drivers to find an alternate way to work, school or any destination. 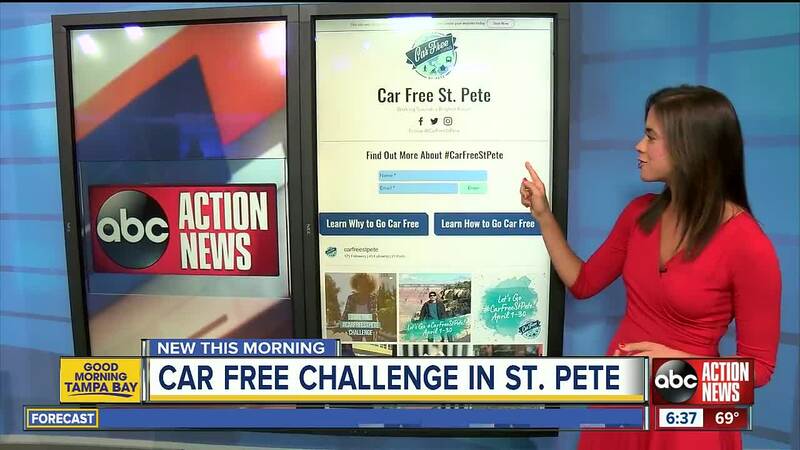 Car Free St. Pete is encouraging drivers to park the car and take an alternative mode of transit. They say it can reduce carbon emissions, save money, reduce stress and congestion on the roads. Throughout April, if you take a picture of yourself using a different mode of transportation and post it, along with the hashtag #CarFreeStPete, you'll be entered for a chance to win a free t-shirt. Some other transportation options include: Coast Bike Share, The Nickel Ride, PSTA and the Cross Bay Ferry. For other cools ways to ditch your car in St. Pete, click here. You can find out more about the Car Free St. Pete initiative by clicking here.